I know all my fellow gluten free friends can relate to having 5 items you totally miss the most and would pick to eat if given a day to freely digest the G word. My husband thinks I’m crazy, but one of my most missed items is Cheez-It® Crackers. I have loved them since eating them at the kitchen table with my grandfather as a little girl. Sure he would top them with limburger cheese but I got over that as an adult. As a preschool teacher let me just say that I am tortured about 5 times a week during snack time! Living gluten free I have found pasta that appeases me, cereal I can feel healthy eating, and even bread I can choke down. However the illustrious cheese cracker has continued to haunt my cravings. One day while shopping the gluten free section at Christmas Tree Shops, way on the top shelf I found a selection of Wellaby’s Cheese Ups. Ok,”selection” may be an exaggeration, there were really only 5 bags left on the shelf. The name and picture on the shiny bag totally caught my interest. Not knowing whether I would like them or not I had my really tall step father hide the three bags I wasn’t getting in the way back so nobody else could find them. Yeah I admit it. I obviously had really high hopes for these crackers…or chips. What would they be like?? I bought both the Classic Cheese and Parmesan flavors. I have never been a huge fan of parmesan, but priced at $1.99 for a 3.0 oz bag it was still less than the cup of coffee I would buy the next morning. If you are paying close attention here I don’t think you will be surprised to learn that I opened the bag on the way home for taste testing! Yes folks, I told you I was jonesing bad for a gluten free cheese cracker replacement. Of course I went for the Classic Cheddar first. Shocker, right?? Well let me tell you the shocker was that these crackers made with 43% real cheese & 60% less fat than a potato chip really had that deep cheese flavor of a Cheez-It®! Not possible you say?? Well let me tell you I was very pleasantly surprised! Just to clarify, they are not the same, but they have a wonderfully cheesy flavor without that horrible gluten free residue left behind on your tongue. Made with potato starch they are a puffed out triangular crisp that to me tastes like a cross between a Pringle and a Cheez-It®. They are thin and super crispy. They will shatter if they hit the ground while you are shoveling them into your mouth. Ok, I don’t really shovel. These are more to be savored, especially the few you’ll find in the bag that didn’t puff out and are double thick. And in case you were wondering, I liked the parmesan flavor too, but Classic Cheddar makes my taste buds much happier. There is even a Smoked Cheese flavor for those that like well…smoked cheese! For those with multiple allergies the ingredients include potato, milk and egg. 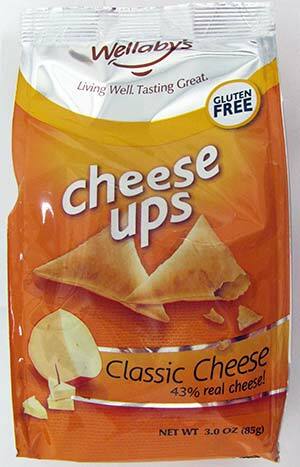 The packaging states that Cheese Ups are gluten, wheat, msg, and gmo free, and produced in a peanut free factory. Enjoy! Wellaby’s Cheese Ups get 5 SPOONS raised high in the air! Buy Wellaby’s cheese ups through Amazon.com by clicking this link! I’ve discovered the best place in the area for a coffee is at my place. I use my lactose free milk, and have home-baked gluten free food. I enjoy my coffee and don’t get sick afterwards. (I bought a good coffee maker.) Now I’m trying to convince my friends that sitting among the herb and flower plants on my patio is a better environment than a noisy coffee shop to meet! Thanks for this post. I definitely have a hankering for the CheeseIts and I always wondered why I would get sick when I ate them. I have not been diagnosed with celiac or gluten intolerant but by the symptoms that I have after I eat a lot of wheat, I’d say I’m justified in believing that I do have it. Was wondering what reference I can use to start my gluten free diet. I am a pasta lover so would love the name of what you have been using, and any and all tips, references, websites you care to share would be greatly appreciated!